Here (yet again) is an example of what REALLY happens when 6 hijackers (more, allegedly, than on any plane on 9/11) try to take over a plane without any significant weaponry. 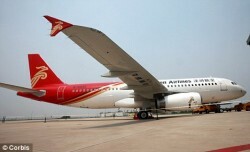 Two men who were part of a six-strong gang, aged 20 to 36, who attempted to hijack a Tianjin Airlines flight bound for Urumqi last Friday were beaten to death by passengers and crew, state media said today. Yet millions still believe that, in a similar situation on board four commercial flights in the USA on September 11th 2001, the passengers and crew were unable to do anything to stop a few alleged terrorists equipped with razor blades taped to credit cards. Said terrorists then went on to demolish two massive skyscrapers, punch a hole in the Pentagon and kill almost 3,000 people. Even more unbelievably, the 9/11 passengers’ inability to do what the Chinese passengers did has since led to the invasion and occupation of at least two countries, the deaths of millions of civilians, and the destruction of civil liberties the world over.